When it was announced that popular 2003 Christmas film Elf was being made into a glitzy West End musical, the show quickly became the most expensive ticket in town and sparked a debate amongst theatre fans. Whilst the price of tickets remains a dubious subject, you cannot help being taken in by the appeal of Elf the Musical which, despite opening a whole month earlier than the official festive season, has you itching to write out your list to Santa as soon as the curtain closes. Thomas Meehan and Bob Martin’s book stays relatively close to the original charm of the film, telling the story of Buddy, a very tall human who has been brought up in the North Pole to believe he is an elf. When the truth is revealed, Buddy takes off on an adventure to New York to find his father, a man who has been naughty-listed. Soon he realises that the whole of New York has lost its Christmas cheer and must sing out loud for all to hear! In a disappointing deviation from the film, Santa narrates the story instead of the lovable Papa Elf. Whilst this spurs on the action, it is reminiscent of a town-hall pantomime, which was probably not the aim. 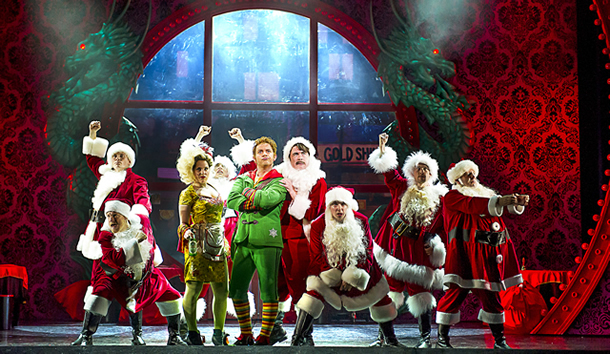 Elf is the extravagant festive production that flaunts its big-budget. Tim Goodchild’s set is outstandingly dynamic, completely changing for every single scene. From the North Pole to New York, the locations are captured with great imagination and colour, including the elves’ huge toy shop to Walter Hobbs’ publishing company to an inventive ice rink. Clever video projection is used to create seamless transitions that are entertaining for the youngsters. It helps that the show has been very well cast. Ben Forster as Buddy is an incredibly engaging performer and magnificent vocalist. He carries the show beautifully, emanating the right amount of charm and innocence to make him completely endearing to the audience. Kimberley Walsh as the love interest is a great vocalist but somewhat disappointing actress. Joe McGann is wonderful as the scrooge-like Walter Hobbs and Jennie Dale is hilarious as Deb, with comic timing that is reminiscent of Melissa McCarthy. A huge surprise was Ilan Galkoff as Michael, who was very sweet and had an impressive voice. The score by award-winning duo Matthew Sklar and Chad Beguelin is delivered with aplomb and is full of winning, catchy tunes. After a tirade of jukebox musicals coming to the West End, it is refreshing to see some successful original songs that reflect the festive feel of the show. The choreography by director Morgan Young is relatively unimaginative at times, but the spectacular vocals redeem the musical numbers. ‘Nobody Cares About Santa’ is a particular joy, with a parade of Santa’s swinging around their toy sacks to a moody, bluesy tune. Elf is full of festive surprises that are so ‘Sparklejollytwinkleingley’, you cannot help but feel excited for the holiday season. In a show that reminds us all of the importance of Santa Claus and Christmas cheer, Elf is a magical treat that will delight and entertain audiences. If you love Christmas, you will adore Elf!